New United States Mint sets and prices will launch this year but details about two of them remain scarce other than their names and prices. 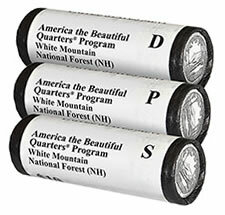 Three-Roll Sets of 2013 White Mountain National Forest Quarters debut on Monday. This is one of the new U.S. Mint products. These additions were alluded to in the U.S. Mint’s annual report as it seeks to expand public interest for collectible coins. Mirrored pricing points for the Birth Set and the Happy Birthday Coin Set may suggest a similar makeup of clad proof coins. The Birth Set has San Francisco struck proofs of the Kennedy half-dollar, the first America the Beautiful Quarter released for the year, a Roosevelt dime, a Jefferson nickel and a Lincoln penny. The Congratulations Set is a bit trickier. American Silver Eagles have traditionally been popular coins that are given for such occasions. The U.S. Mint on Thursday released its 2013-W Proof American Silver Eagle Coin for $62.95, which is close in pricing to the set. But, the product name Congratulations Set suggests it includes at least one coin along with something else. The proof fits less smoothly with this consideration. This year’s 2012-W Uncirculated Silver Eagle is $53.95, with a May release. It could be a better match, but what would be the other coin/item? Speculate away on this one. News about Three-Roll Sets of 2013 America the Beautiful Quarters broke some time back when the U.S. Mint published its preliminary product schedule for 2013. This week the Mint, also in the Federal Register, announced their $46.95 prices. For every design there will be a three-roll set that includes 40-coin rolls of Denver, Philadelphia and San Francisco minted America the Beautiful Quarters in circulating quality. This year the U.S. Mint will continue to offer a two-roll set of ‘P&D’ quarters for $32.95 and a separate roll of ‘S’ quarters for $18.95. Combined, these three will cost $51.90. That makes the three-roll sets the least expensive means of ordering this year’s quarters in circulating quality. The first of the five 2013 America the Beautiful Quarters debuts Jan. 28, 2013. That is when bags, two-roll sets and three-roll sets of White Mountain National Forest Quarters launch. I wonder how many of the S-mint coins will “leak” into circulation. One of them would be a nice find. I sure do hope they still offer the “S” quarter rolls separately and NOT force us to purchase the 3 roll set. But we all know how the Mint works…. 66% + of all the (S) mint quarters bags & rolls will be put back into circulation by 2025, just like the state quarters were! Leaving fewer high ms quality ones for the future! They have a 3 coin set one P,D, (S Circulating quality) not proof like the 2012 set, but what are your chances of getting a high ms 67 + set in a three coin set. Odds are much better finding a high ms example set in P,D,S rolls no bag marks. Get all of them before they are no longer available from the mint.